BEATING what was diagnosed as unbeatable cancer by simply changing your diet might seem far-fetched, but it's exactly what Katrina Ellis claims she did. 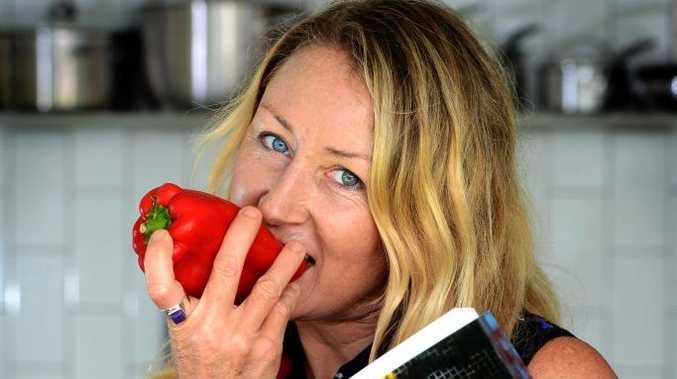 The Cabarita Beach woman says she defied all odds of survival when she switched to a completely raw vegan diet after being diagnosed with ovarian cancer 13 years ago. "I was in Thailand," the mother of two said. "I was always raised on a very healthy diet all my life and was over there cooking very healthy, but I was exposed to a toxic agent. "I believe the cancer was caused by a combination of things." The cancer rapidly grew to the size of a "10-month-old baby". Doctors told her it was too late and the cancer had spread all through her body. "I was 28 at the time and didn't know what to do," the qualified naturopath and iridologist said. "I decided I didn't want to be stupid here and I did chemotherapy." After a painstaking 90 hours of chemotherapy Mrs Ellis said she had no white blood cells left. "It wasn't doing anything so I worked up the courage to go home and made the decision to fix myself," she said. "Everything in my life became raw organic. I decided I didn't want to be stupid here and I did chemotherapy. I threw everything out; I knew I had to go really hard to get rid of it. She went on a journey of self-discovery, spending a lot of time meditating and thinking it was a mind-over-matter situation. A year later, she was still alive and visited a doctor who told her it was completely gone but, it was the most aggressive form of cancer and she would still be dead in a year. She says she is still proving the doctor wrong 13 years later. After her courageous battle she penned the international best-seller Shattering the Cancer Myth. The book details her personal journey as well as divulges some of the recipes she used to combat cancer. But this year the author, mum, cancer survivor, naturopath, iridologist and strong woman released Raw Addiction, a recipe book. She said her latest book was perfect for anyone who wanted to add more raw vegetables into their diet but didn't have a lot of time to do it. "There is so much healing potential in raw foods," Mrs Ellis said. "Each recipe is balanced with the nutrients the body needs to function and heal." A raw vegan movement is nothing new, but Mrs Ellis said some raw vegans do not get the correct amount of nutrients they need in their diet. Her creations are completely nutritionally balanced but also aim to be ridiculously delicious. She also said the book isn't specifically aimed at raw vegans but anyone who wanted more vegetables in their diet to gain optimal health. Mrs Ellis lives off a mainly raw diet but will sometimes have steamed fish if her body feels like it. "Veganism doesn't suit everyone's lifestyle," she said. "We all have different demands in our life and we all know what our body wants and needs." It took 18 months to get the book finished and she said the recipes would kickstart your taste buds. "There is a great chocolate truffles recipe for those with a sweet tooth," she said. "We also have a section about sugar alternatives which discusses the pros and cons of each." From breakfast to dessert the recipe book has a healthy version of something for you and your family to enjoy. In the past few years Mrs Ellis has noticed a big change in clients who come to her Kirra-based clinic. "I've noticed a massive shift," she said. "A lot more young beautiful women are coming to see me about how to get healthy. "I think women are a lot wiser nowadays, which is great because they are our future."